Liberal leadership candidate Justin Trudeau says he is sorry for comments he made in an interview two years ago that have Conservatives accusing him of an anti-Alberta bias. 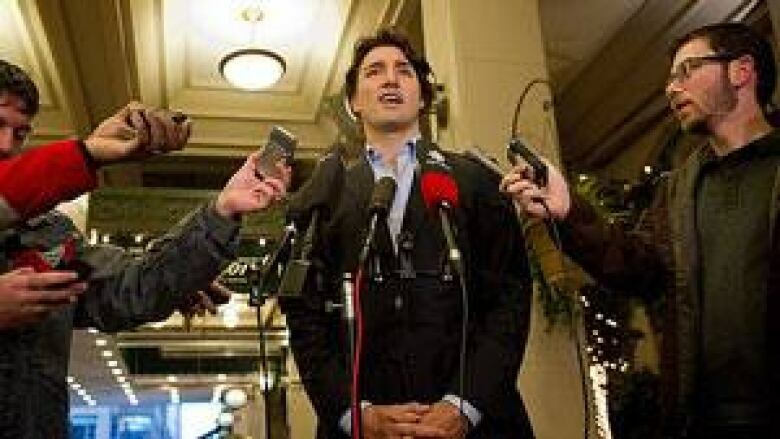 Trudeau was forced to address the comments he made to the Télé-Québec television program Les Francs-tireurs (The Straight Shooters) in 2010 after a Sun Media report republished them Thursday. In the interview, Trudeau said Canada wasn't doing well because "it's Albertans who control our community and socio-democratic agenda." The published comments have touched off a firestorm of reaction from Conservative MPs on Parliament Hill. Trudeau's leadership campaign issued a statement Thursday saying the Conservatives were taking the comments out of context. On Friday, Trudeau offered an apology, but continued to argue his comments were being misinterpreted and that they were directed at the government of Stephen Harper and not Albertans in general. "I'm sorry I said what I did. I was wrong to relate the area of the country that Mr. Harper is from with the people who live there and the policies that he has that don't represent the values of most Canadians," Trudeau told reporters in Vancouver. "It was wrong to use a shorthand to say Alberta, when I was really talking about Mr. Harper's government, and I'm sorry I did that." Trudeau was also asked Friday whether he thought Canada was better off with a prime minister from Quebec, as he suggested in the 2010 interview. "I think Canada is better off with a prime minister who chooses to bring people together and not play up insecurities and divisions and regional resentments any chance they can get, and unfortunately that's what we tend to be getting from both Mr. Harper and now Mr. Mulcair, who has now put a big X over Alberta with his 'disease' comments," Trudeau said, referring to NDP Leader Thomas Mulcair's comments in the summer about Alberta's oilsands industry creating "Dutch disease" in the Canadian economy. The federal Conservatives have seized on Trudeau's comments to attack him, particularly in Calgary, where a byelection scheduled for next week has become more competitive than expected. Alberta MP Michelle Rempel called the remarks "insulting," while Immigration Minister Jason Kenney, who represents a Calgary riding, said Trudeau's words were indicative of "the worst kind of divisiveness, the worst kind of arrogance of the Liberal Party." Trudeau said the Conservatives were "panicking" at the thought of losing the Calgary Centre byelection and are attacking him in response. In the House of Commons on Friday, Public Works Minister Rona Ambrose called on Trudeau to resign his role as critic for amateur sport. Trudeau's fellow Liberal MP, David McGuinty, resigned his energy critic post Wednesday after his comments about Alberta Conservatives were published by Sun Media. The controversy over Trudeau's interview also brought reaction from leadership rival Martha Hall Findlay, who launched her campaign last week in Calgary. "Cons are picking on Justin. He is only one person, does not speak for all Libs — Libs are in the process of choosing who will," she tweeted Friday before following up with, "Everyone knows how I feel about Alberta – and ALL of Canada. I dare the Cons to show some courage and bring this fight to me." P.O.V. : Will Trudeau's comments affect Liberal leadership bid?